This one is for us poor people! It's great for both your hands and nails which makes it extra awesome for us hand washers. A combination of nail polish and frequent hand washing made my nails brittle and break easily - this has helped a lot! It smells like classic mum's hand cream, to me at least. I haven't a clue what the smell actually is but it is neither particularly nice or unpleasant. It just is. It's fine. The cream is effective and affordable. Superdrug always have offers on too, so you can usually buy a few ..tubes(?) really cheap and stock up. While I love Lush, I don't tend to like the scents of their skincare products, however effective they are. I must be the only person in the world that hates the scent of lavender, which is in most of the Lush skincare products I use. Upon receiving this for Christmas I was excited to have more hand cream but apprehensive about whether I'd actually like it or not – but it smells divine, so I use it all the time. I'm rubbish at scents but it smells a little citrusy to me, somewhere in there. My hands are so soft post-Christmas! 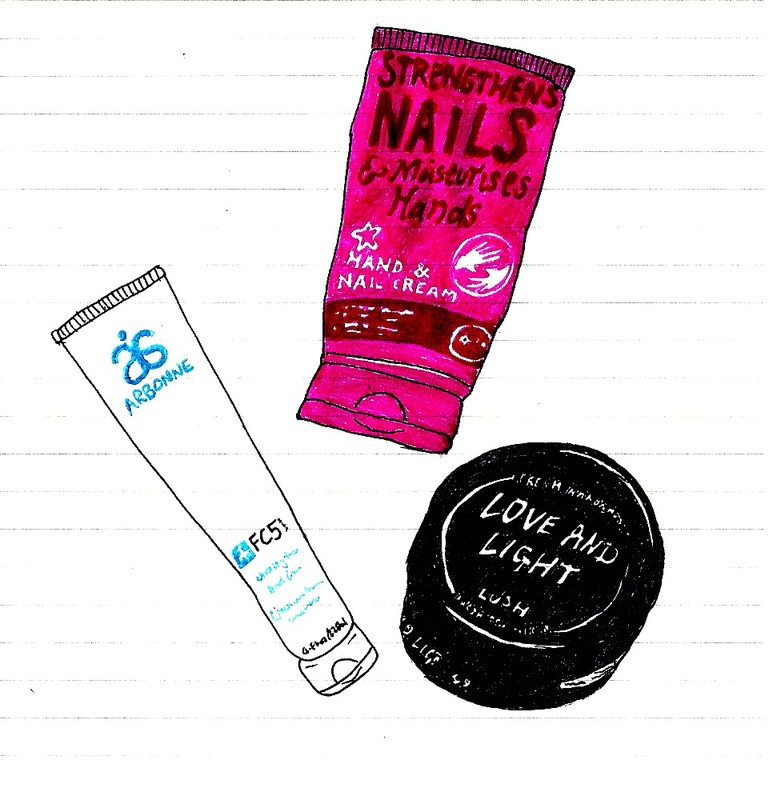 This is the luxury hand cream of the list. It's gorgeous though. It feels really silky as you rub it in and has a mild, pleasant scent that reminds me of citrus infused water. It sinks in really, really quickly, it's impressive. It seems to provide a protective layer that keeps moisture in, but isn't at all greasy. Of course the most appealing thing for me is that, like all Arbonne products, it is free from all the rubbish usually found in cosmetics (including dyes, non-botanical fragrances, mineral oil, formaldehyde, gluten and even parabens if you're avoiding them). The company source ingredients sustainably and their products are botanical. I love them! To buy Arbonne products you need to go through a rep, and as Camilla Gray kindly gifted me this cream to try out, here is the link to her rep page. What are your Holy Grail hand creams? *DISCLAIMER: This post contains a PR sample but my views are 100% honest. (I'm a rubbish liar).